Peter Diamond, British detective extraordinaire, must dig deep into Bath history to ferret out the secrets of one of its most famous (and scandalous) icons: Richard “Beau” Nash, who might be the victim of a centuries old murder. Bath, England: A wrecking crew is demolishing a row of townhouses in order to build a grocery store when they uncover a skeleton in one of the attics. The dead man is wearing authentic 1760s garb and on the floor next to it is a white tricorn hat—the ostentatious signature accessory of Beau Nash, one of Bath’s most famous historical men-about-town, a fashion icon and incurable rake who, some say, ended up in a pauper’s grave. Or did the Beau actually end up in a townhouse attic? The Beau Nash Society will be all in a tizzy when the truth is revealed to them. Superintendent Peter Diamond, who has been assigned to identify the remains, starts making discoveries that turn Nash scholarship on its ear. But one of his constables is stubbornly insisting the corpse can’t be Nash’s—the non-believer threatens to spoil Diamond’s favorite theory, especially when he offers some pretty irrefutable evidence. Is Diamond on a historical goose chase? Should he actually be investigating a much more modern murder? Peter Lovesey is the author of more than thirty highly praised mystery novels. He has been awarded the CWA Gold and Silver Daggers, the Cartier Diamond Dagger for Lifetime Achievement, the Strand Magazine Award for Lifetime Achievement, the Macavity, Barry, and Anthony Awards, and many other honors. He lives in West Sussex, England. "Witty, stylish and a bit of a rogue—that's what people said about Richard Nash, known as the Beau, the notorious dandy who transformed the English city of Bath into 'the 18th century equivalent of Vegas.' The same might be said of Peter Lovesey, whose elegant mysteries pay tribute to the past glories of this beautiful city." 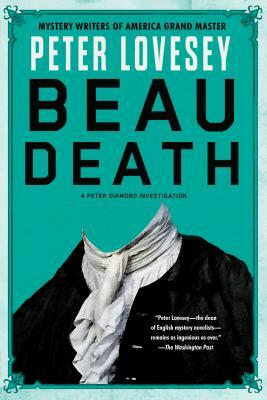 "Peter Lovesey—the dean of English mystery novelists—remains as ingenious as ever in Beau Death." "If you like real history turned into crime clues, this is your book . . . This is a great puzzle plot that will keep you guessing. Just what Lovesey does best." "Peter Lovesey rarely puts a foot wrong." "For Anglophiles who like to leaven their whodunits with laughter, it’s hard to imagine a more pleasurable way to read away the long hours of a quiet, wintry night." "The book, I am happy to say, is as tightly plotted and absorbing as the best of Lovesey’s long-running series." "Lovesey employs his dry, caustic humor to cutting effect." "I always look forward to new entries in this series." "Highly readable . . . Mr. Lovesey moves from a hilarious launching of the plot to a delectable collection of vivid characters and an avalanche of clues." "Peter Lovesey writes at a consistently high level of crime fiction that never ceases to please and astonish." "Astonishingly consistent and endlessly inventive." "Lovesey moves from one dexterously nested puzzle to the next with all the confidence of a magician who knows the audience won't see through his deceptions no matter how slowly he unveils them." "One of the best entries in a long-running series, this exceptional police procedural is packed with imperfect and engaging characters, sophisticated plotting, and abundantly detailed historical tidbits." "The intricate series of plot lines is seamlessly interwoven at the charged conclusion. Lovesey seems to have outdone himself with the labyrinthine maze of multiple murders and mysterious conundrums." "There’s plenty of suspense here—action, too—all told in Lovesey’s effortlessly elegant manner." "The plot is one of Lovesey’s cleverest, and the book is full of his trademark wry humor." "Lovesey's signature understated humor, often historical and at times hysterical, finds its way onto pretty much every page." "An intricate and multi-layered puzzle . . . Diamond's dry wit and perspicacity adds welcome levity to the story." "Simply terrific. . . The humor is dry, but it is there in spades, as is the clever, puzzling and unforgettable mystery that beats steadily throughout the story." "Peter Lovesey's characterisation, humour, and plotting are key, and I'm glad to report that these elements are here in abundance." "As Beau Death elegantly demonstrates, nobody is better than Lovesey at mixing puzzle and procedural. Diamond, with his mordant humor as armor, is, as always, razor-sharp, erudite and thoroughly engaging." "His Grand Master award is well-deserved indeed." "The plotting is deft and very intricate without being overdone, and the characters perform beautifully . . . a sheer delight to read." "A rich and satisfying feast of eccentric and sometimes sweet, sometimes dangerous, quintessential British figures."